As a continuation of our previous discussion about selection criteria of BLE SoC for building BLE based IoT devices, we will discuss in detail about the most important considerations for BLE RF layout design and antenna selection from various types available. 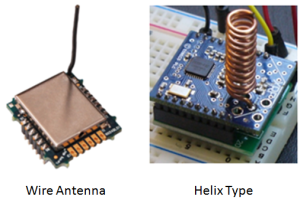 The communication range of a wireless device with a current limited power source depends mainly on the RF layout, antenna design, and enclosure. Increased operating distance can be achieved with the type of antenna chosen together with carefully designed RF layout with few matching components to ensure most of the power from the BLE SoC reaches the antenna. The more power an antenna can transmit from the SoC, the larger the distance it can cover. Both of these are PCB traces differing in how they are constructed for maintaining the 50-ohm characteristic impedance. There are online calculators available which help us to calculate the impedance of the transmission based on our parameter input. Nowadays the SoC manufacturers provide reference designs from which we get the guidelines for routing the RF transmission lines and the values (typically capacitance and inductance values) of the matching components. The designer in addition to the routing guidelines must also note the recommended PCB stackups for desired performances, since the impedance of the RF lines will change depending on the PCB layers stackups. In most of the cases, the PCB fabricator may not match the exact stackup as recommended and at these conditions there will be a need for slight changes in the RF trace width, gaps or thickness to ensure the correct impedance value. Wire antenna: It is a piece of wire rise from PCB plane and protrudes to free space over a ground plane. Wire antenna produces best performance and RF range due to its dimension and better exposure. They can be in different forms such as straight wire, helix, loop, etc. A through-hole pad is sufficient to solder the wire antenna, thus saving the board dimension and hence low PCB cost. PCB antenna: This is a copper trace drawn on the PCB. These antennas are inexpensive and easy to design, because they are a part of the PCB and provide good performance. Meandered trace, inverted F-trace is the most popular PCB antenna’s used in many designs. 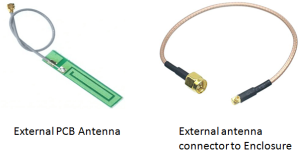 Meandered trace antenna is recommended for applications that require a minimum PCB area and Inverted F antenna is better compared to meandered antenna for radiation, but it requires space higher than meandered antenna. Main drawback of PCB antenna is that, it may require two or more revision to get expected range performance. This can be avoided by using the antenna design application notes and stack up recommended by the chip vendors carefully. Chip antenna: For applications where the PCB size is to be extremely small, chip antenna is a good choice. They are commercially off the shelf antennas that occupy very small PCB area and offers reasonable performance. But the disadvantage of chip antenna is the increased BoM and assembly cost since they are external components that need to be purchased and assembled. Also the chip antennas are very sensitive to RF ground clearance and the manufacturers RF ground clearance recommendations must be followed strictly. There are some applications which need antenna’s to be placed on or outside the enclosure for better reach. In such conditions, there are options for providing antenna connectors on board and extending the connection to the external antenna or other mating connector through shielded wire. U.FL connector: There are miniaturized RF connectors for high frequency signals. The male connectors are generally surface mounted and soldered directly to the PCB. The female connectors are crimped at one end of the shielded wire and the other end may be a PCB antenna or a mating connector such as SMA, MMCX, etc. MMCX connector: These are Micro-Miniature Coaxial connector. They have a lock-snap mechanism which allows 360 degree rotation. It is comparatively better than U.FL in terms of insertion and removal lifetime and has over 10 times that of U.FL connectors. They are also available in surface mount package.